"Monografie Matematyczne" series, vol. 25, Polish Mathematical Society, Warszawa-Wrocław, 1951, p. IV+546. 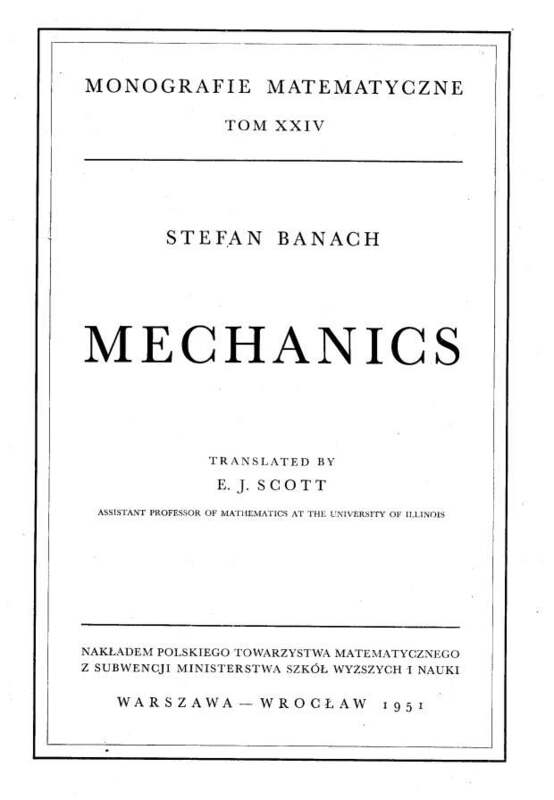 My lectures in mechanics, given for many years at the Jan Kazimierz University and the Lwów Polytechnic Institute, consisted of the contents of this work. I have limited myself to the mechanics of a system of material points and a rigid body. The material covered is suitable in general for university requirements, however, keeping in mind the needs of the students at the Polytechnic Institute, chapter VI which treats of the statics of a rigid body was worked out so that it could be accessible without a knowledge of kinematics and dynamics. It can be read immediately after chapter I when supplemented with several facts according to instructions included in the footnote on p. 231. 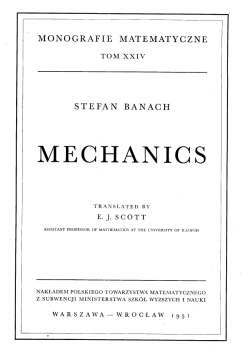 Taking into account the requirements in mechanics at the Polytechnic Institute, I have also given in chapter VI certain information from engineering mechanics. The mathematics necessary to understand this work in its entirely is limited to the elements of analytic geometry as well as to the differential and integral calculus. Other necessary notions and theorems have been given in the text in order not to send the reader to works too specialized. In particular, I give in the Appendix (at the end of the work) a method of solving ordinary differential equations of second order with constant coefficients which arise frequently in mechanics. It is a pleasure for me to thank Dr Bronisław Knaster for his effective help in connection with the publishing of this book, Dr Edward Otto for making the drawings and Dr Antoni Zygmund for help in the corrections. I. Motion relative to a frame of reference. II. Change of frame of reference. I. Dynamics of an unconstrained point. II. Dynamics of a constrained point. III. Dynamics of relative motion. II. Solids, surfaces and material lines. § 7. Rotation of a body about a point under the action of no forces. Angular momentum and kinetic energy. Rotation about a spherical point. Rotation about a point whose ellipsoid of inertia is an ellipsoid of revolution. We deeply thank Prof. dr. hab. med. Alina Filipowicz-Banach and the whole of family of Stefan Banach for their permission to post copies of all the works of Stefan Banach on this website. We also thank Prof. dr. hab. Stefan Jackowski, the Head of the Polish Mathematical Society, and Prof. dr. hab. Stanisław Janeczko, the Head of the Mathematical Institute of Polish Academy of Sciences, for their permission to post copies of the books published by the Polish Mathematical Society in the "Monografie matematyczne" serious.